"These women need a safe environment and regular access to medical care, which ICE and CBP have failed to provide," one senator said. More than a dozen Democratic senators called on immigration authorities to restore presumptive release for pregnant women after a stillbirth in government detention earlier this year and an increase in the number of miscarriages in 2018, according to a letter sent exclusively to NBC News. 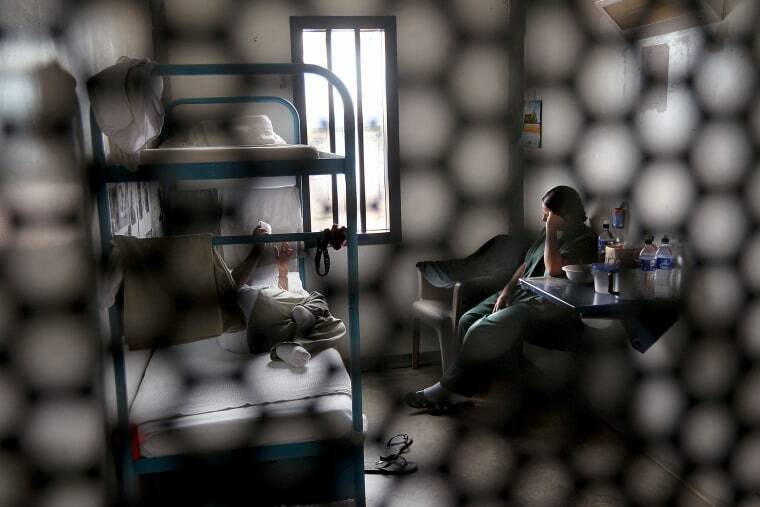 "In the absence of compelling evidence that the detention of a pregnant woman is necessary because she is a threat to herself or others, or is a threat to public safety or national security, the civil detention of an expectant mother for potential immigration offenses is never justified," said the letter, which was sent to Immigration and Customs Enforcement (ICE) and Customs and Border Protection (CBP) on Monday morning. The senators urged ICE to bring back the Obama-era directive of presumptive release "for all pregnant women" in immigrant detention, which President Donald Trump reversed. They also called on CBP to institute measures ensuring "timely and appropriate treatment" for pregnant women in its custody. "Stories of pregnant women being mistreated or having their medical needs neglected while in [Department of Homeland Security] custody are unconscionable," Sen. Catherine Cortez Masto, D-Nev., said in a statement to NBC News. The senator is the lead signature on the letter, along with 15 others including several 2020 hopefuls such as Sens. Cory Booker, D-N.J., Kirsten Gillibrand, D-N.Y., Kamala Harris, D-Calif., Amy Klobuchar, D-Minn., Bernie Sanders, I-Vt., and Elizabeth Warren, D-Mass. "These women need a safe environment and regular access to medical care, which ICE and CBP have failed to provide," Cortez Masto said. The letter comes after a Honduran woman delivered a stillborn boy after going into premature labor at an immigration detention center in Texas in February. In addition, statements from ICE indicate that 28 women may have experienced a miscarriage just prior to or while in ICE custody over the past two fiscal years. The statement said 10 occurred in fiscal year 2017 and 18 in fiscal year 2018, according to a manual review of medical records as of Aug. 31, 2018. ICE said the only stillbirth that occurred in their custody "in recent years" was the incident in February. The senators also presented questions and requested documentation from the agencies about the number of pregnant women detained, how long they are detained and the type of care provided to them. This letter follows another sent to ICE last year in opposition of the decision to end presumptive release. CBP did not immediately respond to requests for comment. ICE said in a page on its website detailing its policy of pregnant migrant detainees that it has “ended the presumption of release for all pregnant detainees” following an executive order by Trump. It now completes a case-by-case assessment of custody, taking “special factors” into consideration, ICE said. Previous policy said that pregnant women were “generally not detained unless their detention was mandatory under the law” or under “extraordinary circumstances,” according to ICE.